Starbucks Helping to Grow Instant Coffee Sales for Others? As I emerged from the D.C. Metro today, someone handed me the package pictured on the right. It contains several NESCAFÉ samples in multiple flavors. Clearly, NESCAFÉ is looking to protect their share of the instant coffee market as Starbucks pushes Via, and I think they’re doing a good job of it with this street-team style approach. There’s a lot I like about the marketing material NESCAFÉ handed out this morning. Two, a lot of busy people suddenly had free samples of the product in their hands, as many of them headed for their office. Someone in my office actually put their package of samples out in the kitchen with an invitation for people to try them. 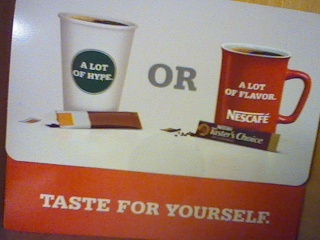 Finally, NESCAFÉ has placed a coupon on the inside flap of their promo piece. So as people are given a chance to sample multiple flavors, they’re getting an invitation to buy more at a discount. But what NESCAFÉ’s free sample really got me thinking about today is that Starbucks may have created a huge opportunity for NESCAFÉ with the launch of Via. Suddenly, there’s more chatter about instant coffee than I can ever remember and—with these samples serving as a nice reminder to people that they are already in that business—there’s a chance NESCAFÉ could see their sales rise thanks to Starbucks. By creating more overall interest in instant coffees, rather than ending up being a threat to the market share of others in the business, Via could end up benefiting anyone with an instant coffee product who markets it well.